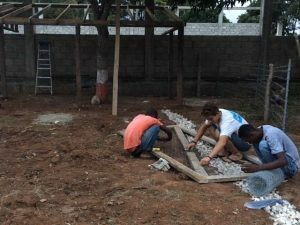 We worked at the school for 4 days total building the outdoor classroom and garden area. 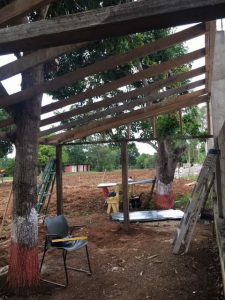 On Friday I finished framing the structure and then the next day I put on the tin roof. Once the classroom was done and the whole garden area fenced in, I built two gates for access. 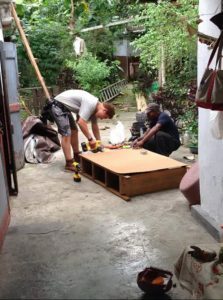 It was hard building anything out of the lumber they had at the school because it was all very warped and splitting, but it was all we had (non-local wood is expensive in Haiti because they have to import it from the States). I installed hinges and stapled chicken wire to the gates and hung them. The last day we were at the school we planted a bunch of starfruit trees and some other trees on the perimeter of the fence. We found a few holes in the barbed wire fencing we put up a couple of days earlier and fixed those. Next we are heading back to Cap Haitian and then to the center in Lambe where I will spend the last couple days of my time in Haiti. 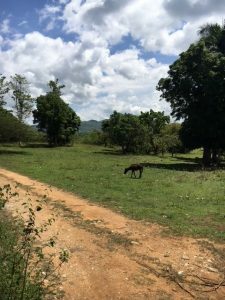 Wednesday we drove from Cap Haitian south and inland to a small town called Pignon in the middle of Haiti. We are staying at a school here and building a garden and outdoor classroom on the campus. On Wednesday we measured out the site and started digging fence posts. 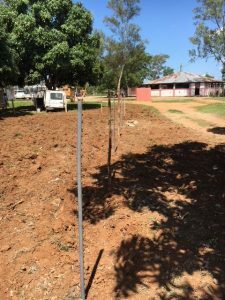 We put in all the fence posts around the garden and strung barbe wire around it to keep out the cows, goats, and pigs that roam here. 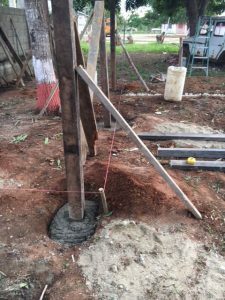 I also helped lay out the classroom, and we dug the footings for the posts. Once we got everything level, square, and plum, we mixed concrete and poured them. The classroom I am helping build is going to be attached to an existing building that is under construction as well. The footings dried over night. Next we stated laying out where the rafter ledger is going to be attached to the existing building. Screwing that in was difficult because all the drill bits we had were weak and the concrete screws were not self tapping. I am still trying to figure out how we can make it more secure. The last thing I did before we stopped for lunch was start putting on the rafters. The pitch of the roof is 2/12, and I am elated that I brought a speed square with me because cutting the rafter tails was much easier. For the rest of the day, I will help finish rafters, then put bird blocking in them, then put 1x2s on top, and lay the tin roofing over that. I also have to make a couple gates for the garden entrences as well. So far everything is going pretty well here. 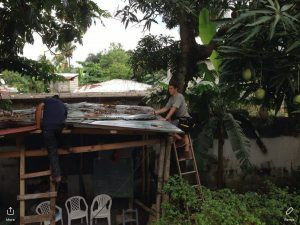 The last few days we have traveled a bit around the north side of the island, and I have been working at the organization center. It is in in Lambe, a small town outside of Cap Haitian where I flew into on Saturday. 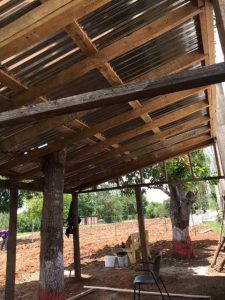 I put tin roofing on an outdoor structure and built a few wooden benches for it too. We traveled with another group to the Citadel, which is a large castle/fort that was built after the Haitian revolution to protect them from other invasions by the Europeans. I am finding that the history of Haiti is fascinating. The revolution of Haiti was lead by the slaves fighting against the French and Spanish that controlled it originally. It was the only slave revolt in the world that was successful. Yesterday I thinned and cleared a orchard with banana trees behind the house where I am staying at. I built some other furniture for them as well. Tomorrow we are driving south to a rural school where I will be building a fence and an outdoor school structure.